Now available. The story that forever changed aviation search and rescue. 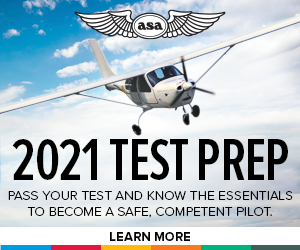 Our brand new newsletter provides information on the newest products from ASA, as well as updates to existing ASA products and textbooks, Federal Aviation Regulation updates, changes to the Practical Test Standards, updates to FAA Knowledge Exams, the latest posts from the Learn to Fly Blog, training tips, links to resources and social media outlets, and much more—all in one place! Click here to read the most recent issue and to subscribe to ENROUTE.